When we had the house painted... hmmm... three years ago, we took down the small, ugly house numbers that were adjacent to our front door. Since then, we've been looking for house numbers that we like. The difficulty was in finding a font in which we liked the particular numerals in our street number. You'd be surprised how many fonts with otherwise nice numerals have a really dorky "1" or oddly proportioned "0". In the meantime, we've had a house number "plaque" that Paul made using a sheet of 8.5x11 paper, a black Sharpie pen and tape. The numbers were really quite nice, but the materials not particularly durable. Over Thanksgiving weekend, we finally found house numbers that we liked. My parents gave them to us for Christmas. Really, they gave us the money with which to buy them, and it took us several weeks to get down to the store to pick them up. Last weekend, I made a paper template, on two sheets of 11x17 paper, showing the locations of the numerals, and the precise spots at which the pilot holes for screws should be drilled. I've seen these templates many times, as professional sign companies use them for installation of signage with individual letters and numbers. They now use computers to generate templates; the "technology" that I used is as antiquated as hand-drafting. 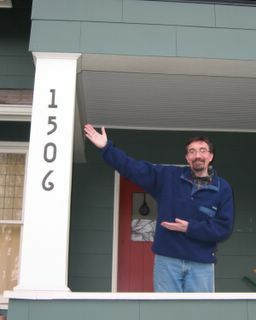 Yesterday, Paul installed our new house numbers. At the time, it was sunny, and the low winter sun on the thick numerals cast deep shadows against the column. By the time I took this photo of Paul presenting his handiwork, the sky was overcast, so they don't look quite as striking. Still, we like them a lot.